If your cornea is not perfectly round, you have astigmatism. More specifically, astigmatism occurs when your cornea has an oval shape, like a football, instead of a round shape, like a basketball. Astigmatism is annoying because of blurs in vision at all distances, in contrast to myopia, which at least allows clear vision up close. Limbal relaxing incisions are a procedure that can correct astigmatism either alone or in combination with other procedures. Limbal relaxing incisions are small incisions made on either side of the cornea near the sclera (Figure 26). These incisions are called “limbal” because they are made in the limbus, which is the junction between the cornea and sclera. They are called “relaxing” because they expand the cornea slightly in the axis in which they are placed. By expanding the diameter of the cornea slightly, these incisions turn an oval, footballshaped cornea into a round, basketball-shaped cornea. Limbal relaxing incisions do not correct either nearsightedness or farsightedness. They purely correct astigmatism. That makes them primarily useful in combination with other procedures that correct nearsightedness or farsightedness but don’t correct astigmatism. For example, the implantable contact lens corrects high levels of nearsightedness very effectively, but the ICL does not yet correct astigmatism. If you have a high level of nearsightedness and astigmatism together, the surgeon will commonly combine the ICL with limbal relaxing incisions done at the same time. This optimizes your vision by correcting the astigmatism as well as the nearsightedness. Figure 26. 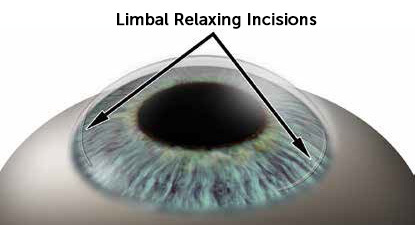 Limbal relaxing incisions are used to correct astigmatism, which occurs when the cornea is oval shaped. The incisions make the cornea more round, which produces normal vision. The same is true with the multifocal lenses used for refractive lens exchange. Multifocal lenses do not correct astigmatism. Implantation of a multifocal lens is often combined with limbal relaxing incisions if there is preexisting astigmatism. In contrast, if you’re having LASIK or PRK, astigmatism is corrected at the same time as your nearsightedness or farsightedness by programming the laser beam to remove tissue in an oval shape rather than a round shape. Limbal relaxing incisions are unnecessary with LASIK and PRK. Similarly, if you are having refractive lens exchange with a toric lens, the lens will correct your astigmatism, so limbal relaxing incisions are unnecessary. If you have had previous vision correction surgery that corrected your nearsightedness or farsightedness but not all your astigmatism, limbal relaxing incisions can be done as an enhancement procedure to correct the remaining astigmatism. Are You a Candidate for Vision Correction Surgery? Are You a Candidate for PRK? Are You a Poor Candidate for PRK? Are You a Candidate for the Implantable Contact Lens? Are You a Candidate for Refractive Lens Exchange? Are You a Candidate for Limbal Relaxing Incisions? Is the Surgeon Board Certified?